There were three very pleased pupils at Dalbeattie Primary when they received vouchers from hub South West’s Audrey Christie for their super entries in a competition to design a poster in connection with the construction of a new clinic in Dalbeattie. 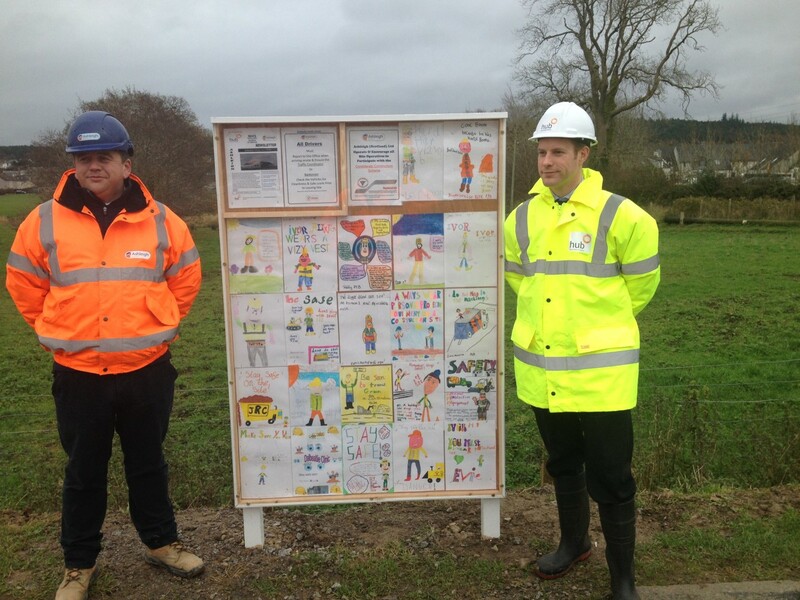 Project manager David Roan, Construction Manager from Ashleigh for the new site, who recently welcomed pupils from the school’s school council to bury a time capsule in the foundations of the clinic site, invited the youngsters to take part in a competition to draw a poster on the themes of ‘site safety’ and the importance of being ‘considerate constructors. Pupils, Orla, Holly and Brooke won vouchers for Dalbeattie Book Shop and are seen receiving their prizes from Audrey Christie. David Roan said he was delighted with receiving over 50 entries. A selection of the posters is currently displayed on a special notice board on the road outside the new clinic site.The school is also delighted to be receiving a new set of football strip from Ashleigh construction in the new Year.